Are you interested in being a dive professional with the skills, knowledge and experience to lead, supervise and teach others how to be safe and comfortable underwater? If so, our A-1 Divemaster program is just what you’re looking for. The combination of our highly qualified Instructor Trainer team, SSI educational materials, amazing facility and 60 years of experience teaching diving to thousands of eager divers, will assure you’re receiving the very best Divemaster Course there is to offer. Yes, pretty bold, but our results speak loudly and proudly. 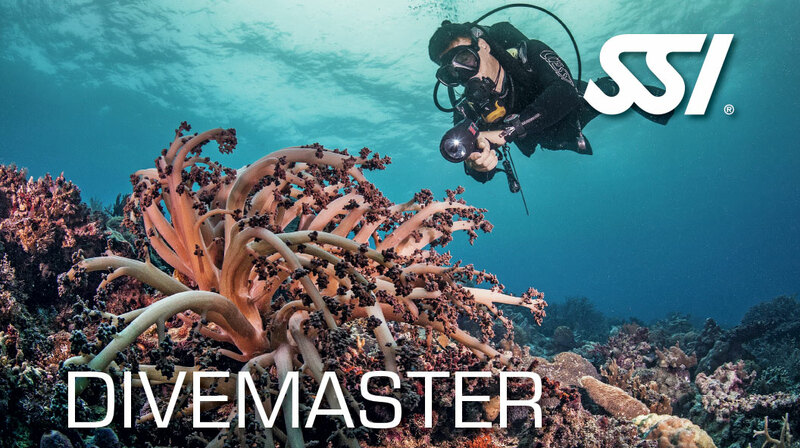 The A-1 Divemaster Course is comprised of two SSI courses: Dive Guide and the Science of Diving Specialty. Please Note: Those wishing to be active Divemasters at A-1 will be invited to participate in a separate and unique mentorship opportunity comprised of hands-on experience at A-1 and the Denver Downtown Aquarium. During this course, your personal diving skills will be sharpened to near perfection while you learn the techniques of organization and the supervision of student divers before, during, and after the dive. The combination of thought-provoking active learning classroom sessions, along with skills training, stamina exercises, problem-solving techniques, and evaluations in the swimming pool will prepare you for the leadership level you’re striving to attain. It’s a serious course designed for the serious diver. Must have completed the Advanced Adventurer program or higher, or hold an equivalent rating from a recognized agency. Have the SSI Diver Stress and Rescue certification or equivalent. Have a personal MySSI account and MID registration number. Complete and submit various important documents. These will be discussed during the orientation session. There are six separate sessions in the A-1 Divemaster (Dive Guide and Science of Diving) Course. PLEASE NOTE: Those wishing to be active Divemasters at A-1 will be invited to participate in the A-1 Mentorship Program. This is where the rubber hits the road. This unique program will be discussed during the Divemaster Course. Mask, Snorkel, Fins, BCD, Low Pressure Inflator, Regulator, Alternate Air Source, SPG, Weight System, Compass, Emergency Signaling Devices, Slates, Exposure Suit, Timing Device, Depth Gauge and Divers Tool. Tanks and Weights will be provided. Have you ever wondered why colors disappear as you dive deeper or wondered what the effects of air and water temperature are on your tank pressure? Why does a ship float and a rock sink? How can you learn to relax underwater and extend your diving time? These, and so many more questions will be answered during this self-study course. The training provided in the SSI Science of Diving program increases your understanding of these topics, and provides you with additional information about decompression theory, and the components of your Total Diving System and its accessories. Our goal is to improve your knowledge of the aquatic environment and the sport of recreational scuba diving, and to ensure that you enjoy every aspect of your diving experience. Be an SSI (remove extra space)Referral Diver or higher, or hold an equivalent certification from another recognized certification agency. This is predominantly a self-study course. You’ll read your SSI digital online manual and answer questions pertaining to the reading material at the end of each section. During the scheduled learning session A-1, your instructor will review (remove extra space)key components of the course and answer questions. Then your instructor will administer a 100 question final exam. PLEASE NOTE: NO fee is required to attend the orientation. It will begin at 6pm and includes an overview of the course, discussion of future dates and an overview of the course content. Gain the skills, knowledge and experience to lead, supervise and teach others how to be safe and comfortable underwater.